Review: The Children who lived in a Barn, by Eleanor Graham | So This is School! There’s a strange appeal for children in stories that allow them to live their lives without the interference of adults. Characters like the Famous Five and the Swallows and Amazons gain their freedom in this way, building their own worlds in which they are the masters of their fate. Fictional children don’t usually have this luxury any more except occasionally in the fantasy genre – the fashion is for gritty, realistic stories where young people struggle to cope or lead a normal life without adults to help them (take Shade’s Children, a science fiction story by Garth Nix, an eerie, unsettling story set in a world where there are no adults). The Children who lived in a Barn (recently reprinted by Persephone Books) treads a path between these extremes, and Eleanor Graham builds an almost-believable story while still retaining the magic of a world where children are their own adults. There are no thrilling adventures here, no mysteries or pranks. This is a straightforward tale of five children – Susan, the oldest, is only thirteen – whose parents go missing in a plane crash, leaving their offspring alone in the family home. This would be bad enough, but days later they are forced to leave when the landlord decides to sell the house. A local farmer comes to the rescue and offers them a barn, and the rest of the book deals with the trials and challenges of their life in the barn – how they feed themselves, cope at school, earn money and stave off the interference of the officious, would-be helpful women of the village. Of course, it’s not perfectly realistic. It is hard to believe that five children between the ages of eight and thirteen would really be allowed to live alone for months in a barn, even during the summer. A number of individuals, including the unpleasant District Visitor, do hover around making the threat of ‘homes, orphanages and adoptions’ uneasily real, but even so a certain suspension of disbelief is necessary. Even to believe in the possibility of the children genuinely being able to support themselves alone requires a fair stretch of the imagination. Eleanor Graham makes it as easy as she can for us by making it clear that the children do get a lot of help – shopkeepers give them food (and haircuts) in exchange for services, Farmer and Mrs. Pearl give them the barn and help out with the laundry, while everyone at school – even their fellow pupils – rallies round to make gardens, knit clothes and make life as easy as they can for the children. They even get a plausible motivation, in the general resentment against the Dunnets’ landlord for turning the children out when their parents were gone. It might be more Swallows and Amazons than Shade’s Children, but The Children who lived in a Barn is slightly redeemed from its lack of realism by its characters. Sue, the oldest of the children, is intelligent, courageous and good humoured, but she also has times of irritability and rebellion. Robert can be responsible and handy, but it takes him some time to understand how serious their situation is and even then he is a bit of a wild card. The twins, Sam and Jumbo, are amusing though not notable, and Alice, the spoilt youngest, finds barn life uncomfortable and is often selfish and whiney. They are all believable characters and I particularly like Sue, who faces up to the challenge of being in charge of five children living in a barn – and of trying to live a normal life, not a Famous Five summer of ginger beer and picnics. But none of them are actually brilliant – they are sufficient for the story, but they don’t transform it. For me, what really brings the story to life is the challenges the children face and the manner in which they overcome each one. Eleanor Graham gives us the details in abundance and to me they are all fascinating. How did the children feed themselves properly when they had almost no money? How did they keep the barn tidy and clean? How did they clothe themselves? What about haircuts? Did they really bother going to school when their parents weren’t there to make them? The hay box, the school gardens, the choirboys, Alice’s disastrous dress – each challenge is met head on, chin up, and vanquished one way or another. Of course, this situation couldn’t last for very long without becoming completely implausible. It’s one thing for the children to live in a barn successfully over the summer, but during the winter it would have been impossible. Eleanor Graham acknowledges this through Sue’s mouth, while behind the scenes the District Visitor and her cronies are arranging to have the children split up and shipped off to homes. The ending is a mad mixture of deus ex machina and jaw-dropping coincidence, but this doesn’t matter too much because its only purpose is to bring about the necessary conclusion. The real strength of the story is not its ending, but its middle – the way the children meet and overcome the challenges of their situation; the way they experience each day and somehow, despite everything, not only survive but are happy. It might need a leap of faith or two, but altogether it is a fascinating story for children and adults alike. I’ve always loved this book – I first read it in the 1950s – I had an old hardback copy of it. I reread it recently which confirmed my memory of it as far more satisfying than most of Enid Blyton, other than perhaps the Adventure series. I was delighted when Persephone decided to add it to their list….. I loved it when I was a child in the 1950s – I wonder if I would still enjoy it now? One thing I do remember is them learning how to use a haybox; probably why I am so keen on my slow cooker these days! I have only read this book fairly recently, a Persephone re-print. I enjoyed it immensely, despite it being so unrealistic. 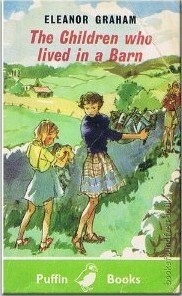 what a lovely cover on the Puffin compared to the dull po faced effort from Persephone Books. Are PB still pursuing their class hatred post Brexit referendum ?